Could Tottenham's forgotten man Vincent Janssen finally be on his way out? Welcome to Sportskeeda’s Tottenham Hotspur transfer round-up – your one-stop shop for all of the Spurs transfer news and rumours during the January transfer window. It’s been a bit of a disaster week for Spurs; following a remarkable comeback win over Fulham, Mauricio Pochettino’s men were then dumped out of the EFL Cup by Chelsea before suffering a disappointing 2-0 loss to Crystal Palace, putting paid to their FA Cup hopes in the process. The feeling amongst most Tottenham fans is simply that the squad might be too thin to sustain a challenge in the Premier League and Champions League, and while Kane, Eriksen, Alli et al might prove that wrong, a January signing with two days left in the transfer window might raise fan morale at least. Here are the latest rumours and snippets surrounding Tottenham’s activity in the current window. 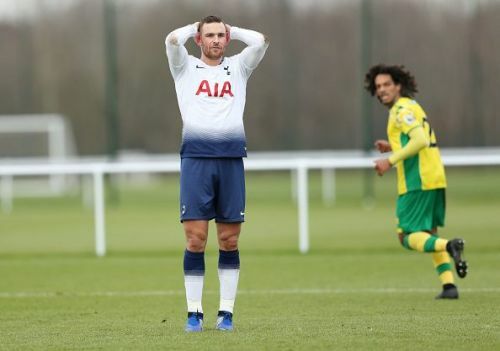 Has Vincent Janssen finally found his escape plan? Dutch striker Vincent Janssen has suffered a torrid time at Tottenham since moving there in the summer of 2016 for a fee of £17m. He scored 27 Eredivisie goals for AZ Alkmaar in his last season there, but since joining Spurs he’s only found the back of the net on 6 occasions. Then again, he’s hardly had the chance; used as a substitute throughout 2016/17, he’s appeared for Spurs just once since the end of that season. Janssen spent 2017/18 on loan at Fenerbahce, but a return of 5 goals in 18 games was hardly earth-shattering, and since his return to Spurs it’s been pretty clear that he doesn’t feature in Mauricio Pochettino’s plans. That’s become even more notable recently, as Harry Kane’s injury has given Fernando Llorente a starting spot while youngster Kazaiah Sterling has been promoted to the main squad. Janssen? Nowhere to be seen. That’s why it hardly comes as a surprise to see that Spurs are ready to offload the striker, and according to Sky Sports, La Liga side Real Betis might be his most likely destination. It’d be a good chance for Janssen to reboot his career, particularly if the move can be finalised before Thursday. The wildest part about the report? Tottenham apparently value him at £15m – just £2m less than they paid for him initially, despite his lack of success and appearances over the last two and a half seasons!